We are now building the 2 piece hard dodgers. All are currently supplied without windows. Dodgers must be trimmed to fit each boat by the installer/owner. Approximate dimensions of each size are listed below. Dodgers require a deposit, and typical lead time is 2-3 weeks. Dodgers are supplied as 2 loose parts (front and top), finished in white gelcoat. Click for approximate footprint dimensions. we can cut windows using patterns to match your installation if needed. The most common dodger mounting method is depicted below. 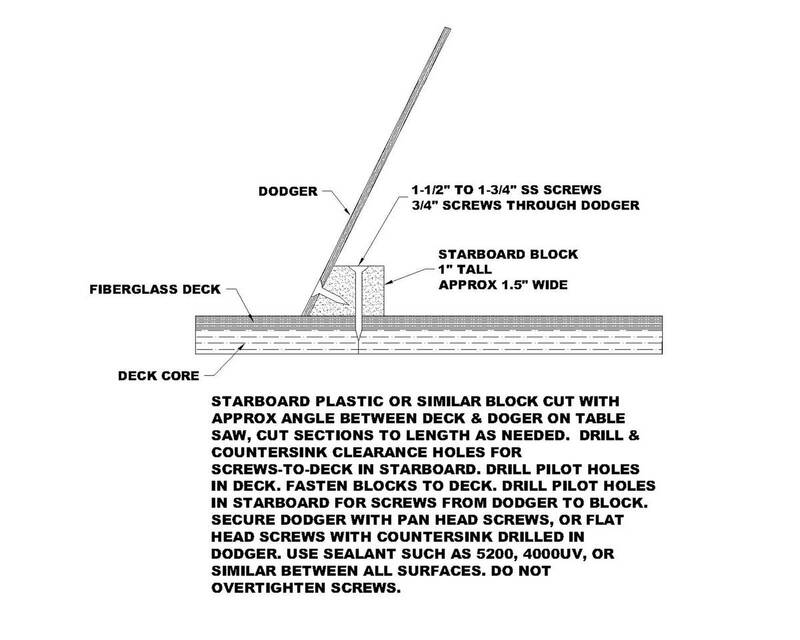 Epoxy sealed wood and other materials may be used instead of Seaking's Starboard® Plastic for the mounting cleat. 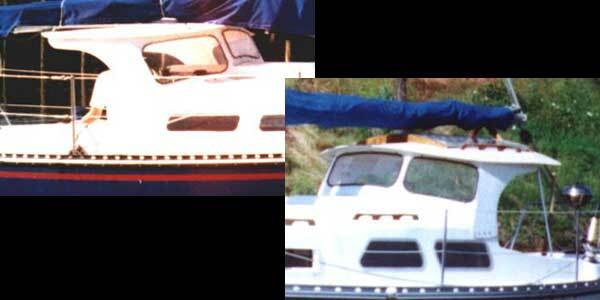 Other methods, such as glassing to the deck (permanent), have also been very successful. Windows: There have been many variations used for installing the Dodger Windows. We recommend Acrylic, sealed with weather-stripping and secured with turn button locks. Being able to remove the windows in hot weather is a plus. The windows are also easier to replace should one become cracked, crazed, scratched or otherwise damaged. We can supply the turn locks with machine screws and stand-off's of different lengths to match your window thickness. A few installations have used custom glass windows (we can order them, though they run around $350/window in laminated glass with aluminum clamp frame (3 needed per dodger) and have a 6-8 week lead time). Others have simply screwed/bolted acrylic plexiglass panels in place. Anything from 1/4-1/2" will work. 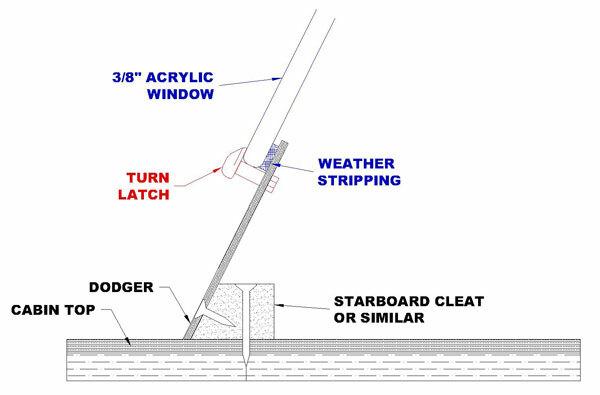 We suggest 3/8" unless expecting frequent extreme weather sailing (in which case 1/2" polycarbonate (Lexan®) may be a good idea) Some installations have also used plastic H channel to secure the windows, however this material is now hard to source. The most common is to use acrylic windows secured with turn button locks. We recommend installation of a wiper on glass windows only as they tend to scratch plexiglass. There are several good "plastic polishes" out there that provide UV protection and help water bead up and roll off. Some of these contain silicon so should be applied carefully, as silicon on gelcoat or painted surfaces can make fiberglass or paint repairs difficult later on. Hardware: Many owners mount handrails, stainless aft supports, gps sensors, edge trim, and other equipment to their hard dodgers. Some dodgers may include foam core in their top panel, so be sure to use proper mounting methods for cored panels where appropriate.